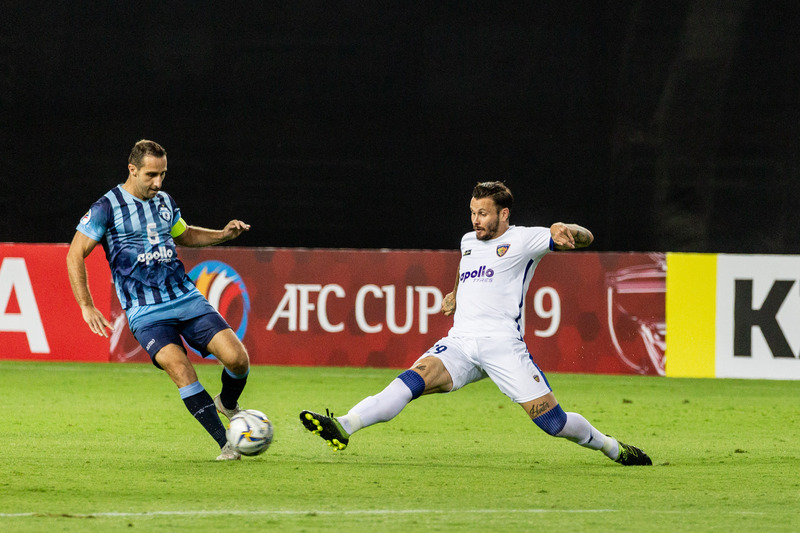 Ahmedabad, April 3, 2019: Chennaiyin FC drew 0-0 with Minerva Punjab in an all-Indian 2019 AFC Cup group stage opener at The Arena Stadium here today. This was both club’s maiden appearance in the group stages of the continental competition. It was also Chennaiyin’s fourth successive clean sheets in all competitions, in what was an intense encounter. 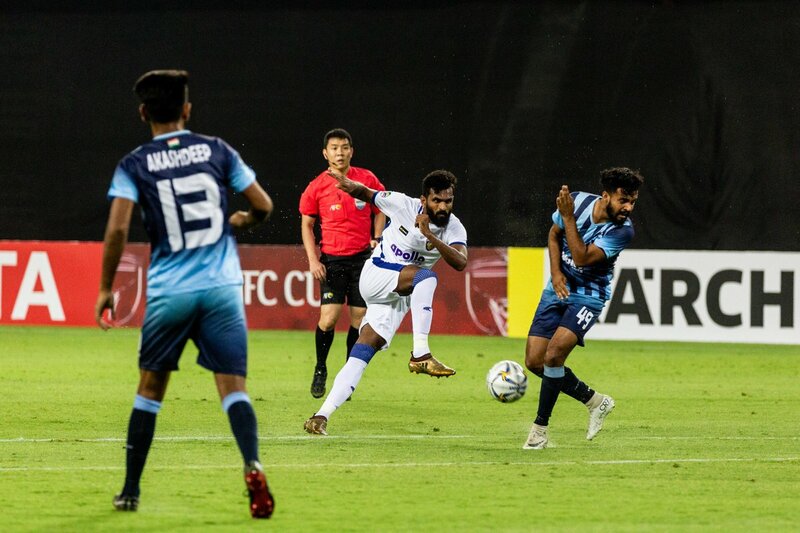 Head Coach John Gregory made three changes to the CFC starting eleven that beat Mumbai City FC 2-0 in the Hero Super Cup encounter last week. Anirudh Thapa, Isaac Vanmalsawma and Gregory Nelson made way as Thoi Singh, Halicharan Narzary and Raphael Augusto started. Dhanpal Ganesh and Jerry Lalrinzuala began a second successive game from the bench, on their return from injury. For Minerva, all three of their new signings – forward Samuel Lalmuanpuia and defenders Kareem Nurain and Robert Primus started from the outset. After a slow opening few minutes, Chennaiyin grew into the match with a succession of quick chances. The first fell to Jeje Lalpekhlua in the Minerva box, but the striker’s shot deflected out for a corner. The resulting set-piece saw CFC’s Brazilian center-back Eli Sabia head it wayward. Minerva then tested CFC keeper Karanjit Singh from distance in the 25thminute. Ghanaian midfielder Kalif Alhassan’s shot was parried away by the custodian. Few minutes later, Samuel stung Karanjit’s gloves with another shot from distance after the ball fell to him from a CFC clearance. From the corner, Alhassan’s header hit the upright and went out for a goal-kick. Minerva made a change soon after the restart, with Moinuddin replacing Prabhjot Singh. And Chennaiyin brought on Anirudh Thapa for Halicharan. Thapa coming up against his former side, having played for Minerva in the 2016-17 I-League season on loan from CFC. The first big chance of the second period fell CFC’s way on the hour mark when Thoi’s header from a Tondonba cross went agonizingly wide of the far post. Minerva then made their second change with a quarter of the game to go, when Makan Chothe was replaced by Akash Sangwan into the final quarter of the game. Chennaiyin had a sustained spell of pressure in the ensuing minutes over their opponents. Vineeth had couple of shots from distance but to no avail. Soon after, Thapa led a break for CFC and spread the ball wide to Thoi, who charged into the box and fired in a low cross that was headed away well by Kareem. CFC made their second change of the evening when midfielder Dhanpal Ganesh came on for Thoi. The local Chennai man continuing making his second appearance of the season on his comeback from injury. Minerva made their final change soon after when Thoiba Singh replaced Samuel. Thapa put in an energetic cameo performance, leading the charge for CFC in the final third. Chennaiyin continued to knock on the Minerva door in the closing minutes with Thapa central to their cause, but the visitors held on as their maiden AFC Cup group stage ended in a goalless stalemate. In the group’s other game earlier in the day, Bangladesh’s Abahani Limited Dhaka beat Nepal’s Manang Marshyangdi 1-0 away from home.